I’m trying to get back in the habit of Drawing Something New Every Bloody Day, a habit i’ve managed to maintain for years at a time before but have repeatedly fallen out of and always had difficulty getting back into. (Motivation to keep a four-hundred-day drawing streak going is easy. Motivation to start a new streak is not.) So i’ve got it jammed in as a daily on HabitRPG, which means now i must do it, or i lose my Perfect Day stat buff and dammit, i want that buff, at least on PER and INT. On the subject of HabitRPG, i’ve been weirdly obsessed with gamification lately. ‘Weirdly’ because i’m really, really not a gamer. Nothing against games or gamers, it’s just not my thing, unless you count a bit of coli-grinding on Flight Rising. Even as a kid, i played Super Mario Brothers and DDR, and had a GameBoy for boring family trips, but any video game conversations beyond ‘the princess is in another castle’ went over my head. But try applying game principles to real life and i’m all over it. Fitocracy, Nerd Fitness, HabitRPG, Duolingo, whatever. Even if the ‘gamification’ is just ‘you get points and a certain amount of points allows you to level up’, which really isn’t much as far as gaming is concerned. 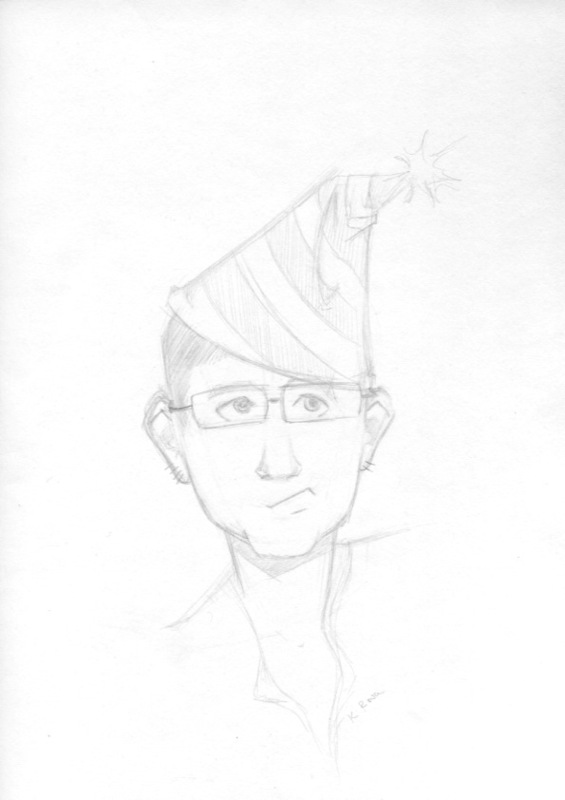 Hence the HRPG Absurd Party Hat featured in today’s sketch. This is pretty much the extent of my gamer fanart …at least until i finish scrolling my FR mage.